If you try this recipe and let others eat first..iam sure you will be left out with empty bowl and spoon. yeah this one is very tasty. try out for a change. fry the following ingredients well without oil. Remove the cover of the small onions. I know it is time consuming and boring job..i do this by watching TV. In a kadai, heat the oil, add mustard seeds. when it crackle's, add the small onions. fry them well. the colour change and aroma raising is the point to add the lemon juice,chilli powder,turmeic powder, and salt. fry it till the raw smell of the powder goes off. now grind it into a paste. season it with mustard and curry leaves and add the fried powder and mix well. i prefer this chutney with hot idlies. To my surprise it suited well with chapathi's. Recipe Source: Aval Vikatan.. 30 variety thokku's. With Besan flour sprinkled above kovakkai..it will taste good.. In a kadai..add oil and let it heat. now add the kovakkai slices and cook by covering it with a lid in a low flame. on cooking for 5-10 minutes, add salt,turmeric powder,chilli powder and mix well. now add besan flour, mix well. let it cooked for another 5 minutes and stop the flame. When Sankranthi..we prepare this curry. it's one of my favourite curry. I have simplified the method by cooking all the vegetables together.my ammamma used to cook and roast the vegetables separately and she prepares this curry. that will give a unique taste. Remove the skin of the vegetables and pressure cook it. see to that, you don't cook them so mashy. now in a kadai/thick bottomed skillet, add oil. when the oil got heat,add mustard.wait till it crackles, now add curry leaves and all the cooked vegetables. add salt, turmeric powder, chilli powder, sambhar powder and mix well. roast them all together. roast it well till the whole vegetables turn into light brown colour. now add the tamarind water and jaggery. mix well. let the curry get thickened(sundu). you can serve this with hot rice, hot idlies and dosa. thou i prepared this on sankranthi.. i couldn't post it hot. I love both brinjal and peanut. i have tasted this dish in a andhra-speaciality hotel. Cut the brinjal in cube shapes. 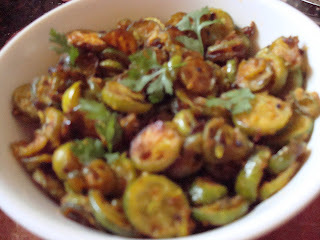 once you cut it soak them in water to avoid blackening of brinjal's. now in a skillet, add oil..when it is heated up, add mustard seeds.when it pops up..add curry leaves and peanuts. fry them well till the peanut is roasted well. now add brinjal's and fry it. ad salt,turmeric powder and chilli powder and fry the brinjal's. let they be cooked in low flame for about 10 minutes with a lid on. 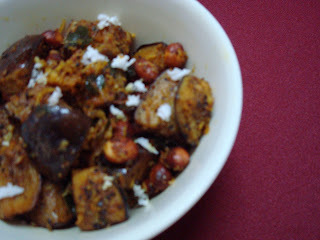 when brinjal's are cooked add the grated coconut and mix well. 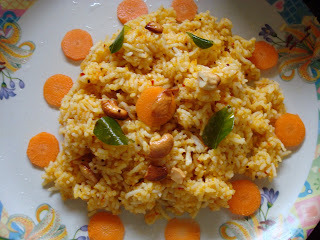 serve with sambhar rice/rasam rice. Once we cook some dish for first time..and getting "wow's", "excellent", "super" credits like this..will make the dish very close to our heart.is it not? 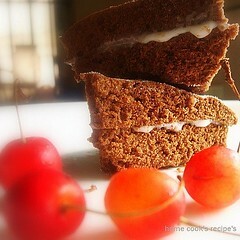 This is one, that is close to my heart.. i prepare this whenever my friends come home for first time. Have a skillet..add a spoon of ghee. and roast the semiya. i prefer to roast it till it reaches golden colour. keep the roasted semiya aside. have saffron dipped in 4 spoons of milk, keep it aside. now have a wide vessel, add 5 cups of milk and add sugar, keep stirring and let the sugar melts. boil the milk. when the milk boils add the semiya, crushed cardamon and keep on stirring. allow the semiya to get cooked well. when milk gets thicker, add the saffron milk and roasted cashews. 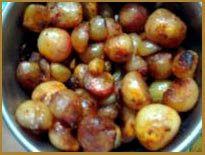 Have a spoon of oil in a skillet and fry all the items except cashew-nut mentioned for grinding. make a paste by adding cashews and little water. keep aside. also prepare tamarind water. 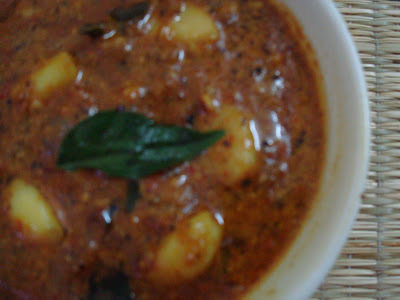 now in a kadai..have 1/2 cup of oil,add mustard,when it crackles,add fenugreek seeds, urad dal(1 spoon) and curry leaves. when they turn brown, add the garlic and small onion. fry them..till they are well cooked. now add the grinded paste. now add sliced tomatoes and turmeric powder. fry them till tomatoes are cooked and add the grinded paste. mix well,add salt and tamaraind water. now allow it to boil..till the oil seperates and comes above. enjoy this with hot rice. best suited for idli and dosa. I was thinking what could be the name reason of the word cutlet. (i) A thin slice of meat, usually veal or lamb, cut from the leg or ribs. (ii) A patty of chopped meat or fish, usually coated with bread crumbs and fried; a flat croquette. ohh..people have substituted potato for meat. 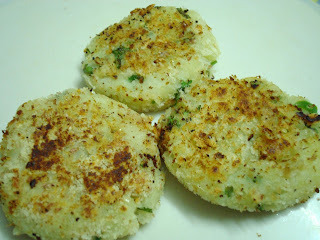 can anyone suggest a name for potato cutlet(ordinary vegetarian cutlet). Recipe Source: Foodie's of Timesnow News channel. speacilaity of this one is...this is OIL-FREE cutlet. hopefully we can call it as sinless cutlet. Add corriander leaves, salt, chopped green chilli's to mashed potato and mix well. shape it in coin form. now apply the crushed peanuts on both sides of coin shaped potato. fry them in hot tava. need not use oil..since oil from peanut is sufficient for it to get roasted down. it fills your tummy also satisfies your taste buds. Did You Count? Is the count is less than 99 then please leave the link of your blog in the below comment form. 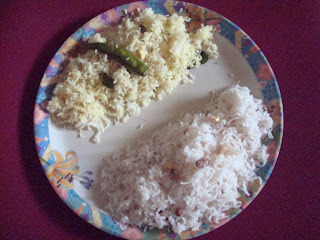 Soon after our marriage, my hubby was asking me to try puttu, as it was his favourite. But as far i know, preparing puttu was a lengthy process of washing the rice, draining them and powdering them and steaming. when i told all this process to my hubby, he was the one gave an intro about puttu maker and puttu podi, soon i got convinced and gave it a try. It still remains to be our favourite brunch on week-end's. 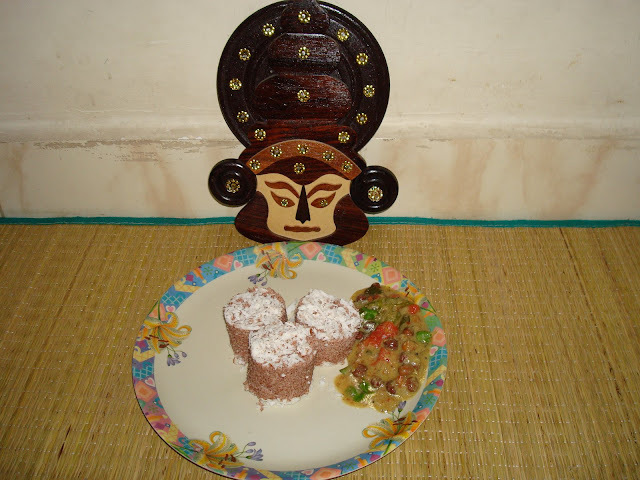 If you don't have a puttu maker, You could follow shriya's Recipe. If you look at her puttu's picture, you cant control yourself on trying it soon. If you have soaked Kadala/brown chick pea overnight, this delicious break-fast can be done in just 10 minutes. This puttu's best pair is kadala curry. i also prefer to eat it along with sugar. 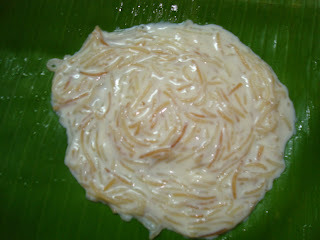 Whenever we eat this puttu, we got to have a banana and a glass of milk, for easy disgestion. First heat the water in puttu maker's bottom part(till it's neck). Meanwhile have the puttu powder in a large vessel and add pinch of salt. now keep sprinkling water and mix. it should come out very soft. don't add too much of water. Note: It should be very soft and it should just look like grated coconut. In the pipe of the puttu maker..first fill with grated coconut and one fistfull of puttu podi. a spoon of grated coconut and a fistfull of podi. do this altenatively. 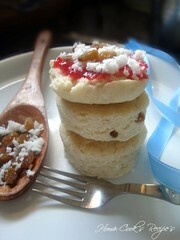 on the top finish it with grated coconut. Steam it for 3-4 minutes. 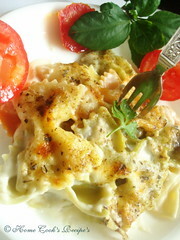 let it remain on stove for a minute, even after switching off the flame. Heat oil in a kadai, add mustard and let it splutter. now add slitted green chilli's, curry leaves. Add sliced onions and fry them. add the sliced tomato and fry it till they become soft. Now add chick peas, salt, and a pinch of turmeric powder. Grind some chick peas, coconut scrap's and one green chilli. Add this grinded paste to the mix in the kadai. now transfer the contents of the kadai to cooker, add water and pressure cook it for 3 whistles. This Leaves for RCI-CUISINE OF KERALA hosted by jyothsna of currybazaar. 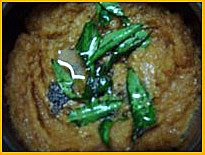 season the broked idiyappams with oil,mustard,curry leaves,green chilli,salt and mix well with the idiyappams. add lemon juice finally and mix. 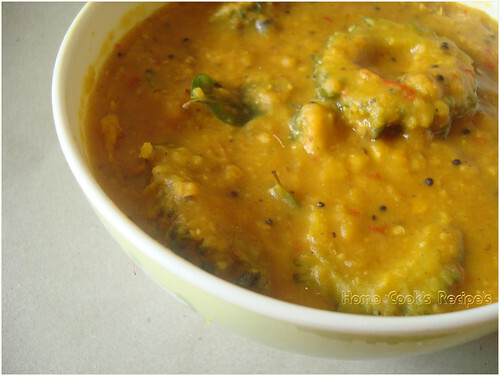 On last Friday, my husband placed a request to me to ban sambhar atleast for a week. he actually said dont make me gemini ganesan. 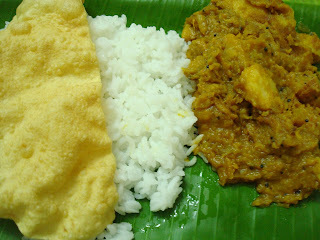 well gemini ganesan is a tamil actor and people call him sambhar satham/thayir satham as he prefer to eat them often. 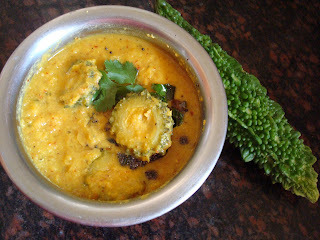 as we are vegetarians i feel the required nutrients can be given thru sambhar. since my husband asked to ban sambhar i was thinking what to try. 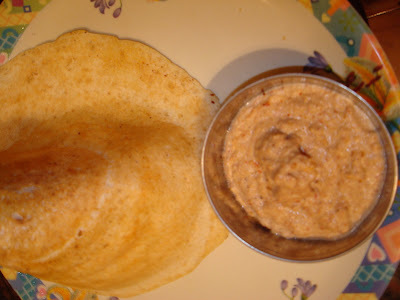 On blogging i found this Pagarkai pitlai.yahoo i found- i tried it too. well this is my ammamma's trademark one. my ammamma is an excellent cook..when she was in the beginning stage of learning to cook..she used to write it in a note book. and she tried each dish once a day. thats the method to learn cooking..isn't it. i have read this pagarkai pitlai in that note. First cut the pagarkai into round slices and boil them in adequate water. after it has become tender, the grinded paste has to be added. 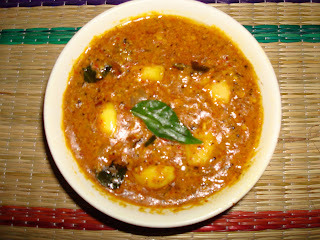 Fry the urad dall,chana dall,pepper,red chilli and grated coconut and grind them into a paste by adding little water. On adding the paste to pagarkai, add the boiled and mashed tuvar dall. add turmeric powder and little salt. now season it with mustard, curry leaves and asafoetida powder. Give out a try to find out what's that new taste resting in it.